A show for food and gardening lovers, the event hosts a range of cookery demonstrations, gardening talks, vegetable displays, vintage tractors, crafts and more. Inspired by Autumn, a true celebration of the best seasonal food. Inspired by Autumn, a true celebration of the best seasonal food, the countryside, gardening, vintage village and nostalgia. After a long year there's nothing better than enjoying the fruits of the wonderful season. A show for food and gardening lovers, the event hosts a range of cookery demonstrations, gardening talks, vegetable displays, vintage tractors, crafts and more. Families and Friends can enjoy a day out to remember. RHS Flower Show - Over 100 nurseries attend the show with fantastic displays. Experts are on hand to answer any questions. 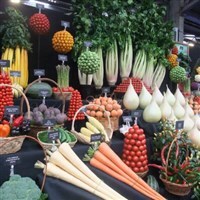 Harvest Pavilion - Giant vegetable displays to see. From giant leeks to enormous pumpkins and huge onions. Plus the Midland Society Vegetable Championships. World of Animals - A chance to meet animals from around the world including mules, dogs, goats and sheep to name but a few. Forgotten Skills Marquee - Rural crafts including felt making, wood turning, spinning and stick making. Floral Art - Floral displays with dramatic and beautiful designs. Food & Drink - Superb food and drink stands selling everything from pies and cakes to fine cheeses, pickles and meat. Shopping - As Christmas is looming, the show has a vast range of shopping opportunities including clothing, jewellery, gardening treats, flowers and more. We guarantee you will come home with a bag full of goodies.